Cook and stir turkey in nonstick skillet until no longer pink, stirring to break up turkey. Add seasoning mix and water; bring to boil. Cook on medium heat 2 to 3 minutes. Stir in beans; cook an additional 5 minutes, stirring constantly and mashing beans slightly with fork. Stir in 1/4 cup of the cheese. Spoon into serving bowl. Top with remaining cheese and tomato. Serve as a dip with crackers. Garnish with minced fresh cilantro or parsley. 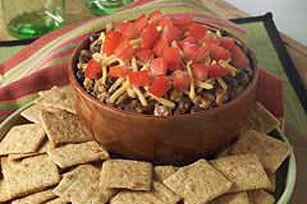 Makes 3 cups dip or 24 servings, 2 Tbsp. dip and 16 crackers.